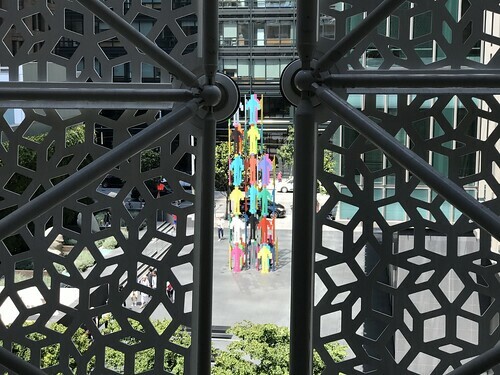 After years of construction it seemed like the new Transbay Salesforce Transit Terminal Center would never open; and yet today, it finally did… sort of. It’s clearly unfinished, and construction workers were still there today (a Saturday) working on the gondola. The underground train platforms weren’t open, and no physical work has been done to even build the tunnel to the station. So perhaps it’s best to think of this as opening day, with a few major caveats. 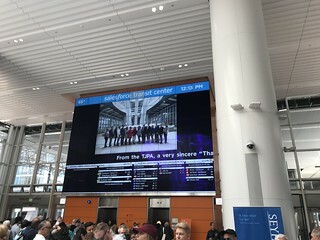 For now only a few local transit agencies serve Salesforce Transit Center via bus, with bus operations to and from the East Bay to start tomorrow. Permanent restaurant and retail space is also still also on the to do list. But enough about the future for the moment; let’s start with what’s there now. The building itself is hard to miss; it’s a wavy undulating mesh hovering over several streets, with trees popping out from above. 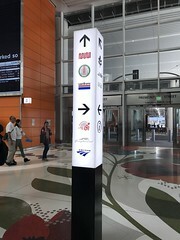 Heading in just past Salesforce Tower is an enormous lobby, with monolithic signs everywhere pointing to different transit agencies. Filled with natural light, the lobby is bright, clean, and frankly looks like a transit station. Not all the displays showing departure times were hooked up yet. I kind of expected just to walk in and check the place out, but little did I know many others had the same idea. Turns out I’m not the only one who likes to see new things. Despite getting there early I had to wait in a long line for the escalator. SFPD acted as crowd control, only letting groups up at a time. It seems the crowds weren’t expected; the lines leading up to the escalators and elevators were ad-hoc, taking up so much space that a group of dancers gave up on dancing and began posing for photos instead. 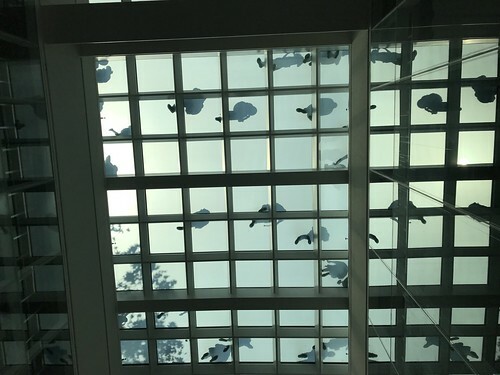 When I finally got on the escalator I looked straight up and saw a skylight… with shadows of people standing on it. Normally standing on a skylight is a bad idea, but this one is intended to act as a floor. The main escalator skips the second floor, heading straight to the bus stops on the third floor. Here you’ll be able to take a bus to the East Bay and beyond. For opening day it was a sort of museum exhibit with presentations from local transit agencies. 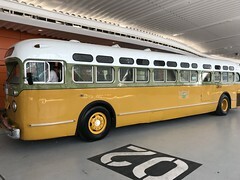 AC Transit showed off their new double decker bus. 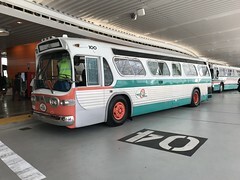 Various transit agencies had well-preserved antique buses on display. Someone had brought in an old car from Hupmobile, a semi-obscure defunct car manufacturer. 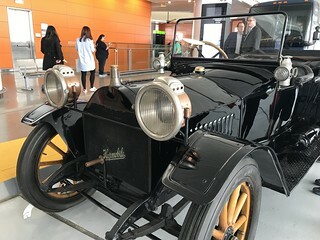 I confess I thought it was a Ford Model T at first glance. I was a little thirsty after waiting so long to get up to there. The vending machines were largely not operational yet. 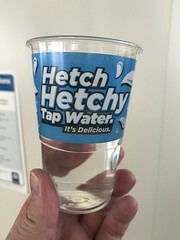 Fortunately SFMTA had a table with free Hetch Hetchy water and cups to match. The real star of the show on the third level is the suspension bridge. This is a bus-only bridge over Howard Street that can be easily spotted from Second and Howard. They were letting people walk onto the base of the bridge to get a peek at it, but no further. It’s too bad they didn’t incorporate a sidewalk with space for people to take photos, I could imagine this funny little bridge being a popular selfie spot for travelers. The entire third level was open to let people walk around. 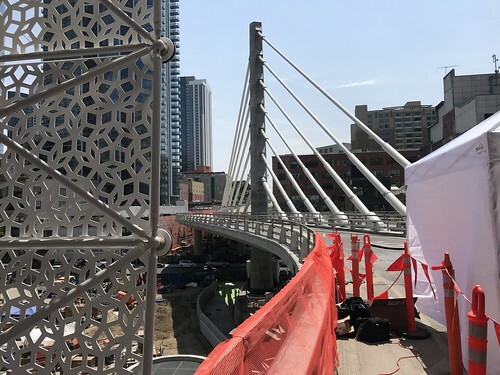 Normally you won’t be able to get up close to the metal lattice “skin” of the building on the bus level, but for opening day there was no risk of getting run over by a Greyhound. I’ve watched the lattice go up in sections for what felt like ages, so it was neat to finally get a peek outside from within. Obviously people hadn’t flocked here to see a bunch of buses. 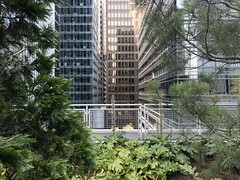 The real draw was to see Salesforce Park, the city’s first elevated park. Despite crowd controls this was wall-to-wall people, gawking at the scenery. It’s a bit of a head trip — you look one way and there’s a green park with trees and grass, you look the other way and it’s office towers and skyscrapers. Unless you look over the ledge there’s not much visual indication that you’re above ground at all. This dissonance may grow with the trees and shrubs themselves. Plaques throughout the park explain what you’re looking at — a fountain (it was off), seismic joints in the building, plants in the garden, etc. There’s a playground for kids, a couple of plazas, and a few grassy areas for lunches and picnics. 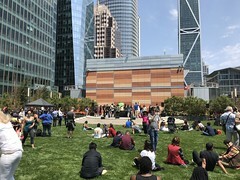 The park connects directly to both Salesforce Tower and 181 Fremont. The sky lobby for Salesforce Tower hasn’t been completed yet; I could see construction workers and unpainted drywall behind glass windows. I’ve heard this park was inspired by New York City’s High Line Park, but I’ve yet to visit NYC so I’m not able to make any comparisons. For opening day there were a few vendors in one plaza, selling food, coffee, beer, and oddly enough cookie dough. Stands with free to borrow books and board games were available as well. There were a few tables to sit at, though not nearly enough to meet demand. When the novelty wears off I could see this park as a place for nearby workers to take a lunch break. Bands and DJs played at two stages in the park. Due to all the buildings around it, some parts of the park were shady whereas others were sunny on an unusually warm San Francisco afternoon. One big question that kept lingering in my mind was how this new station would outlast the one it replaced. 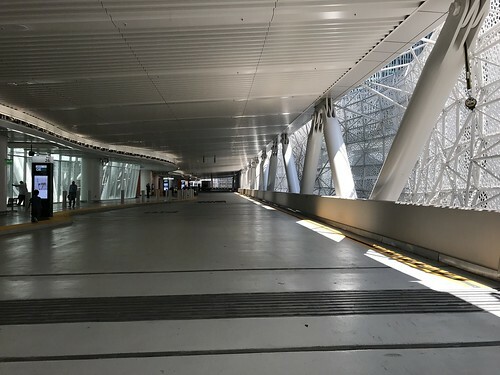 Although the old Transbay Terminal was once touted as the “Grand Central Station of the West,” by the time I was around to see it the place was kind of a mess. The “terminal” aspect of it largely referred to the trains that once arrived at the station coming over the Bay Bridge. The building’s restaurant and bar had closed ages ago, and the waiting area was essentially used as a homeless shelter. 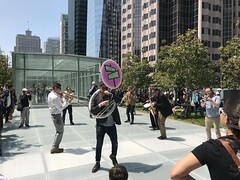 Until train tunnels are built — this time from the Peninsula side, and eventually perhaps a second Transbay Tube — it’s hard to see how the Salesforce Transit Center will be much more than a fancy elevated park. The bus level is nice and all, but you don’t need much space for a bus stop. It’s also worth pointing out that the new low-cost bus operators like Megabus and Flixbus haven’t announced plans to stop at the Transit Center. Perhaps the most odd omission is the lack of connection between the Transit Center and Montgomery Station. It’s a very short walk, hopefully some signs will appear soon directing travelers between the two. Should be easy enough to fix. If the new Transit Center has one thing going for it, it’s the neighborhood. 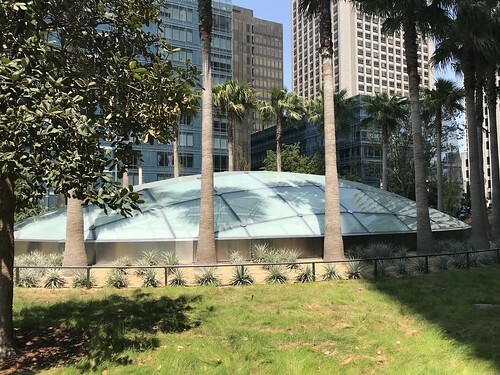 Between when the original Transbay Terminal was built and today, the surrounding area has grown tremendously. Factories and shipping businesses were replaced by offices filled with knowledge workers. 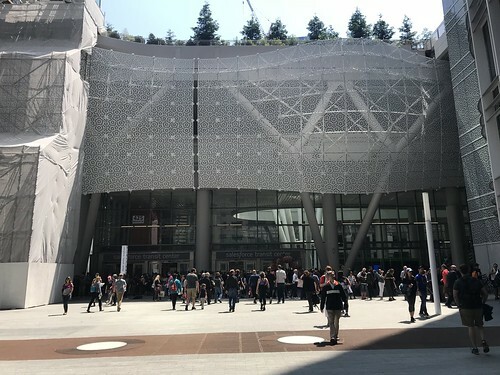 Moscone Center opened, expanded — and is being expanded again, right now. New hotels sprung up, new subways, a new baseball stadium… the list goes on. This version of the Transit Center seems more likely to succeed; at least if its underground train platforms ever see service, that is. 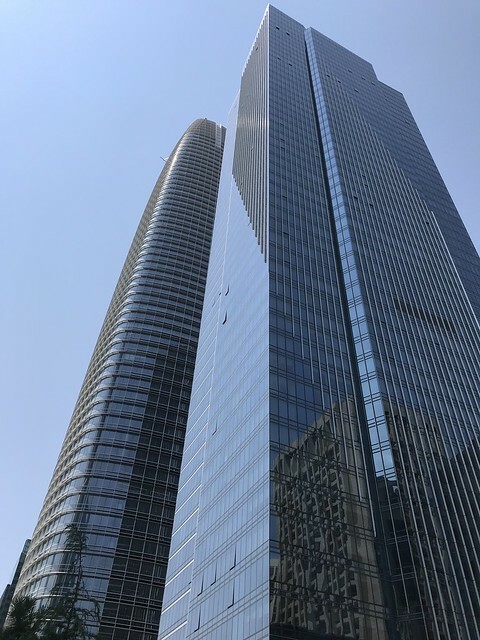 Of course, all of this will have been for nothing if the Millennium Tower — currently sinking and leaning towards Salesforce Tower — comes crashing down. Perhaps that should be addressed before the next earthquake, let alone before any new tunnels are built in the area. 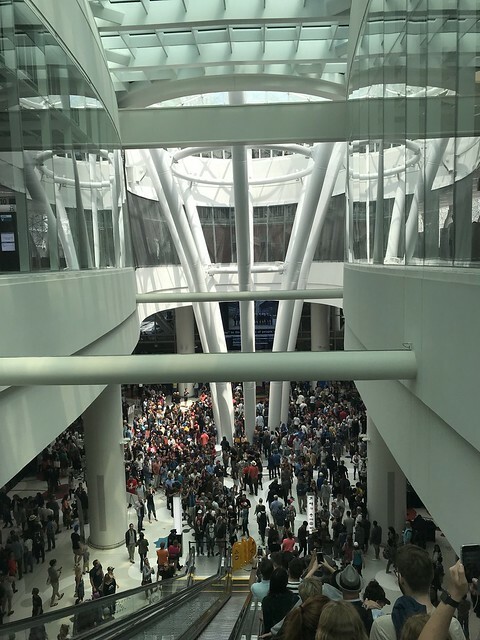 By the time I made my way back to the escalators to leave, the crowds had grown immensely — I was glad I’d arrived early. 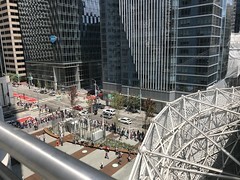 It also seemed unintuitive to me that so many folks wanted to check out the new Transit Center when the city was also hosting Outside Lands, the Filipino Parade, and a Giants game all on the same day. With all of those activities going on, who knew the opening of a new Transit Center and park would attract such a large crowd? Not me, that’s for certain.